Cellar Craft's Showcase Series white wine kits include a huge 16L of varietal juice and concentrate! Sources from some of the finest vineyards around the world, these wines really shine! Under contract with Cellar Craft, the vineyards used to create these kits are limited to a harvest load of just 3 tons/acre. Gently processed and soft pressed, the juices are then settled by gravity alone - no enzymes, filter aids or fining agents are used in the process. Additionally, the juices are never altered - no sugars, botanicals, esters, etc. have been added. What you get is essentially professionally handled varietal white must, slightly concentrated. 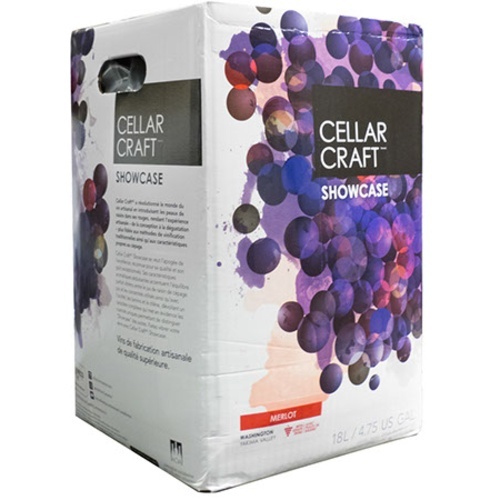 Like other kits on the market, Cellar Craft's Showcase Series white wine kits come with all the ingredients you'll need to make a great wine out of the box. However, we encourage you to also experiment with different yeast strains and oak styles to create a wine that is exactly what you're looking for and truly unique. While technically ready to bottle and drink in 6 weeks, Cellar Craft recommends aging these wines for 1 year or more to see full development of the wine's character. Choose to age in the carboy if you want the opportunity to play around with acidity and finishing additives later, or age in the bottle to see what you get straight from the manufacturer. Just be careful - we all know how hard it is to keep your hands off once the wine's in the bottle! An amazing, full-bodied, aromatic wine with a creamy mouth-feel. Unbelievable aromas and flavours of apricot, mango, pineapple, guava, kiwi, tangerine, orange blossom and spiced pear absolutely dazzle the senses. Our Flavour Reserve balances the grape’s edge and creates a full, off-dry, lingering finish. On its own, 1 glass will almost exhaust your palate. Pair it with spicy, Asian foods and discover magic! Aamazing with Thai curry. Drink young and not over-chilled. Enjoy your kits, a new one for me. Thanks! Cellar Craft kits are well organized, instructions are easy to follow. This is my fourth Cellar Craft kit. Looking forward to this one, as I won’t have to wait two years to enjoy! First time making this one... smells great! Started fermenting right away. The bentonite was hard to dissolve. I think I should have used warmer water and mixed it before adding to fermenter. I hope it continues to go as well as it has smelled and looks while fermenting. These kits make a nice Viognier This is my third. Excellent kit and wine. Recommend colder primary fermentation temperature of 60 to 65 degrees F. Every person trying this wine has RAVED about it, regardless of their typical preferences on wine such as robust reds or dry ultra oaked Chardonnay. I highly recommend this product. This kit delivered a great flavored Vio. I am making the Viognier for the second time. A very nice wine. I just bottled this wine a week ago. It spent 1 month in the secondary. One week later, I'm having a glass while writing this. I really like this wine. I will be ordering another kit pretty soon, as I promised to split it 3 ways with some friends. The aroma teases of a slight grapefruit. The flavor has a slight tease of grapefruit, followed by a slight dried apricot note. Somewhere in there, there really is some orange blossom lingering. I added a very small amount of the F-pack for back sweetening. Maybe 2 ounces tops. It was enough. I added BA-11 yeast. It worked really well. Better than the yeast description indicated. It took about 2 glasses before my palate was starting to feel a little overwhelmed. You will like this kit.